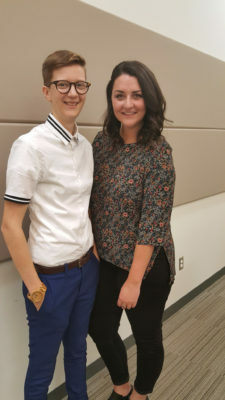 Grace McDonell and Lauren Coles got the news last week that they will be given the opportunity to meet with Randy Boissonnault, an MP and special advisor to Prime Minister Justin Trudeau on LGBTQ issues. McDonell and Coles are leading members of the TRU chapter of the advocacy group OutLaws, and are slated to travel to the Supreme Court of Canada in late November. They are acting as intervenors in Trinity Western University’s case to instate an accredited law school, which has been hindered by its controversial “community covenant,” which stipulates students not engage in sexual intimacy outside of marriage between a man and a woman. Prior to meeting with Boissonnault, Coles and McDonell will be speaking to another member of parliament, Pamela Goldsmith-Jones, over the phone. In both of these engagements, the third-year law students will discussing government outreach with the LGBTQ community and exploring ways that LGBTQ law students can be supported. “For us to be able to have that voice and give that voice to people is incredible, and it’s not something that either of us fathomed having the opportunity to do when we came to law school,” Coles said of the upcoming conversations. On getting the news about these meetings, Coles and McDonell reached out to other equity groups in the area, including TRUSU’s Pride club, the equity committee and Kamloops Pride. The pair is hoping that the meetings with members of parliament and the court case itself will shine more of a light on the importance of diversity within the profession of law. “To have a decision in our favor would be a huge step towards diversity in the legal profession,” Coles said. She added that losing the case would be “heartbreaking,” but that there are always things that can be done outside the courts. Coles was referring to other efforts taken to improve diversity in their ranks. One such example is the leading role that the TRU OutLaws have taken on the case, although they are in a coalition with the University of British Columbia and the University of Victoria. Another is the equity committee, which McDonell sits on. Ensuring that LGBTQ students have equal access to a law education is a key part of why some organizations chose to deny Trinity Western’s proposed law program accreditation. It is also the reason some organizations applied to intervene on the case. According to McDonell, an intervenor is a third party that joins a lawsuit to ensure their own rights and interests are protected. For the OutLaws, this means intervening to ensure the rights and freedoms of LGBTQ law students are upheld. The TRU OutLaws have been involved in the case for a few years, and appeared as an intervenor in both the B.C. Supreme Court and the B.C. Court of Appeals. The hearings at the Supreme Court of Canada will begin Nov. 30. Until then, McDonell and Coles are thankful for the support they’ve gotten from their professors and peers at TRU. For more information or to follow McDonell and Coles’ journey to the Supreme Court of Canada, email truoutlaws2017@gmail.com or follow @tru_outlaws on Instagram.